Before I tell you my cat story, I want to mention that all the details of what I’m featuring with today’s picture are below. 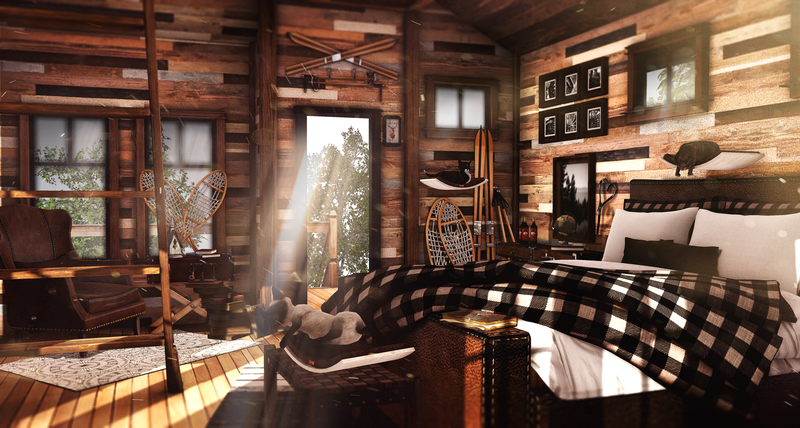 I’m showcasing lodge decor by Artisan Fantasy, cats by JIAN, some gacha decor by 22769 and all this inside the tree house by Trompe Loeil. The tree from the windows and doorway are by Little Branch. My cat story. When I was cleaning out my inventory I found 4 kitty cats from events I attended going as far back to 2014. I don’t know too much about the cats other than they are breedable cats and they require that you feed them. Now if you know me at all then you know I prefer dogs to cats. On a whim I decided to birth all 4 starter cats. These cats were all different colors. The first was a blue cat, which I appropriately named Azul for its color. The others were white, pink and the last a mixture of light colors. They roam around, they eat and sleep and ask for attention. I found them amusing. I kept them. Maybe two weeks later I get some offline message from one of my cats… “I just had a kitten.” I logged in to find a box near the cat, which is the birthing box. It takes all of 10 minutes or so to birth it, the box shakes when there’s like 2 minutes left announcing the arrival of the kitten. It’s a cute mounting of excitement process. The smallest adorable ball of fur was born. It sprinted off into a run as soon as it got on its legs. To make a long story short. I found a second box. Three of the cats were sitting near each other. Azul was sleeping off to the side on its back. He looked exhausted and sort of smug. Now if you touch the cat you get the menu and you can find out information on each cat. The breed, the color of eyes and who the parents are. You bet I know which cats were naughty. In this case all 4. Alexa, this was a lovely scene. The cat is beautiful. And it was a delgith to read about the birthing of these kittens. Good story. What an amazingly cozy scene you stayed here all the items are incredible!